Vogue Paris is easily one of the most predictable magazines in the business and in 2018, it welcomed back a whole host of familiar faces including Kaia Gerber, Anna Ewers, Kate Moss and Natasha Poly. 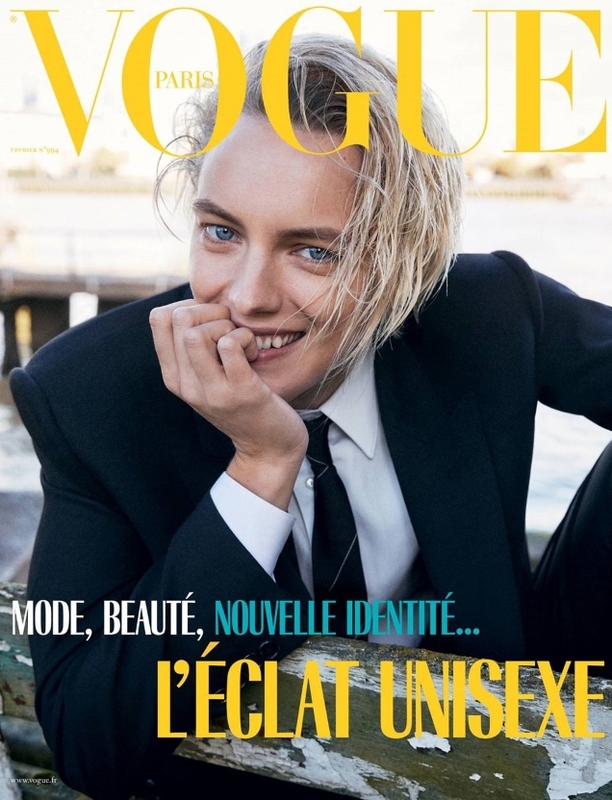 But the magazine is starting off the year with a surprise, featuring androgynous model and actress Erika Linder on the February 2019 cover. The Swedish beauty and Nicolas Ghesquière favorite was photographed by Mikael Jansson and styled by Emmanuelle Alt in a suit from Hedi Slimane’s debut Celine collection. The cover garnered mixed reviews from our forum members. “Wow, surprising choice! Definitely on board with this. She’s a stunning, yet underrated actress. There’s something very 90s about the shot, in a good way. And her cute smile along with the yellow made the cover look light and joyful,” said Benn98 the moment the cover struck. “This is a very refreshing cover. That smile is contagious. The colors worked as well,” exclaimed MON. “I really like it. It’s luminous, simple and I love how she has wonky teeth and there’s little Photoshop,” Morgane07 commented. “I have never heard about her. But I enjoy what I see. It’s bright and it’s much needed in our cloudy winter days!” appreciated Valentine27. Not everyone was here for it, however. “Wow, what an unappealing cover, hate everything about this!” said Miss Dalloway. “Hell no, this looks terrible. Not her, not the styling, it’s the photography that is really really lacking here. VP really is beyond salvation,” voiced EstefaniaAbaddon. “Tomboy with a tousled blonde bob reminds me too much of last August’s issue with Iselin [Steiro], and if ‘unisex’ is where the mood of Vogue Paris is heading, I think I’ll wait it out,” tigerrouge said. A hit or a miss of a cover from Vogue Paris this month? Share your thoughts on the subject here.